Free Shipping Included! Spare Tire Trash and Gear Bag w/Seat Organizer - For Jeep/SUV/RV by Offroading Gear at Kerinci. MPN: SPRTR-2414. Hurry! Limited time offer. Offer valid only while supplies last. The Ultimate Bag for Your Next Offroad or Camping Trip Introducing the most versatile bag you'll ever need on your next off-road or camping trip. The Ultimate Bag for Your Next Offroad or Camping Trip Introducing the most versatile bag you'll ever need on your next off-road or camping trip. 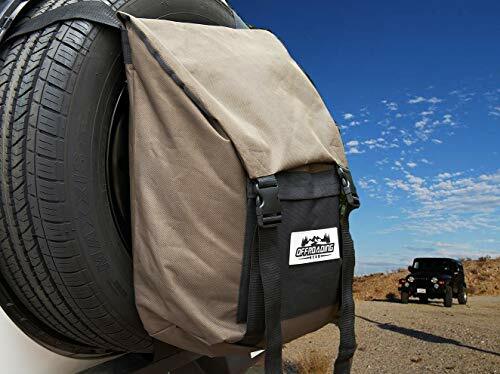 This incredible bag from Offroading Gear can function as a spare tire bag, seat organizer, or backpack thanks to its innovative mounting options. Best of all, it's a universal fit and can fit any vehicle including Jeeps, SUVs, trucks, or car. This bag is deal for storing camping gear, tools, clothes (wet or dry), trash or nearly anything else you can throw at it. You'll have an abundance of space thanks to the 15+ gallon carrying capacity and the two zippered accessory pockets. It measures a massive 24"x15"x9" and is built from heavy duty 900D Polyester. Includes a one-year no questions asked warranty. Don't go Offroading or Camping without this bag! Spare Tire Storage Bag - Store over 15 gallons of recovery gear, tools, trash, or anything else you need on your next adventure! MULTI-FUNCTION - SPARE TIRE, SEAT ORGANIZER, OR BACKPECK - The innovative design from Offroading Gear allows this bag to function as a spare tire bag, a seat organizer (with bonus top facing seat buckle), or backpack. It's the only bag you will ever need on your next offroading or camping trip! DURABLE - Constructed from UV Treated 900D Polyester with double-stitched seams this bag is built to last. Includes a "no questions asked" 1-year warranty. If you have any questions about this product by Offroading Gear, contact us by completing and submitting the form below. If you are looking for a specif part number, please include it with your message.